Oscar Wilde abandoned journalism and hated fashion – so why is his essay "The Philosophy of Dress" so important? “After his marriage to Constance Lloyd in 1884 and the birth of his two sons, Wilde began to make his way into London theater, literary, and homosexual scenes,” says the biographical sketch at the beginning of the 2003 Barnes and Noble Classics edition of Dorian Gray. Missing from these admittedly cursory sketches is the middle period of Wilde’s career, from roughly 1882 to 1888, during which he wrote dozens of mostly unsigned pieces of journalism and, for two years, was the editor of the magazine The Woman’s World. 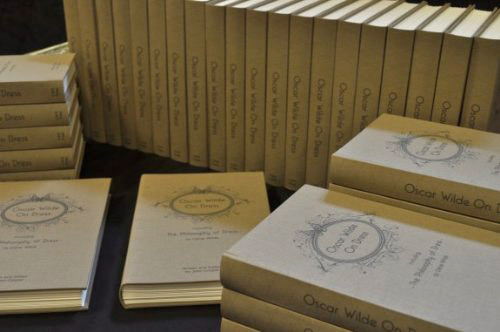 Wilde was, in fact, so prolific a journalist and critic that his magazine and newspaper work fills two volumes, edited by John Stokes and Mark Turner, and published this month in the United States by Oxford University Press, part of the now seven volume Complete Works of Oscar Wilde. And thus, we’ve come to see Wilde’s “true literary life,” when he wrote Dorian Gray, The Importance of Being Earnest, Salomé, and A Woman of No Importance, and made his mark as a piercingly funny avant garde social critic and dramatic visionary, as a kind of spontaneous explosion of genius and self-invention. Failing at brilliance, it’s been long imagined, from a somewhat determinist perspective, Wilde was so unflappably clever and intellectually original he could flip personas, almost as if playing a game. “Wilde’s game centered on masks, a game he relished…both in all seriousness and with delight in its manifest absurdities,” writes Richard Allen Cave, editor of the Penguin Classics edition of The Importance of Being Earnest and Other Plays (2000). I’ll be a poet, a writer, a dramatist. Somehow or other I’ll be famous, and if not famous, I’ll be notorious. He began to imagine that “to locate Wilde the writer we must use the mantra of his quotation as a roadmap.” Youthful bravado or nonsense, the sequence of poet, writer, dramatist became for Cooper a research framework. He wanted to find new Wilde material that would help tell a richer story of this evolution, both personally and professionally, and that would provide links — seams, we might venture — between poet and writer, writer and dramatist. Then, this spring, he found it: a body of work, including Wilde’s first major piece of published prose writing, The Philosophy of Dress, an essay published in 1885 and mentioned again only once more, in 1920, on clothing, dress, and fashion. comes from the perfection of its own being and not from any added prettiness. And that consequently the beauty of a dress depends entirely and absolutely on the loveliness it shields, and on the freedom and motion that it does not impede. Through his own rigorous and clear-eyed analysis, Cooper weaves the strikingly thick fabric of Wilde’s journalism career, drawn distinctly from his first and second tour of the United States and the lectures he gave on art, aesthetics, dress, and fashion. The second tour and lecture series was devoted to dress and it became the basis for The Philosophy of Dress, published April 19, 1885 by the New York Daily Tribune. 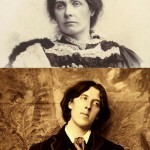 The reaction to the essay — also lost until now to history — was so strong that it reversed Wilde’s reputation from outrageous dandy to serious writer, and it led to his appointment as the editor of The Woman’s World, which he widely devoted to the same issues. …a well-made dress is a simple dress that hangs from the shoulders, that takes its shape from the figure and its folds from the movements of the girl who wears it…a badly made dress is an elaborate structure of heterogeneous materials, which having been first cut to pieces with the shears, and then sewn together by the machine, are ultimately so covered with frills and bows and flounces as to become execrable to look at, expensive to pay for, and absolutely useless to wear. Cecily: I am afraid I am not learned at all. 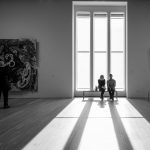 All I know is about the relations between Capital and Idleness—and that is merely from observation. So I don’t suppose it is true. Miss Prism: Cecily, that sounds like Socialism! And I suppose you know where Socialism leads to? Cecily: Oh, yes! That leads to Rational Dress, Miss Prism. And I suppose that when a woman is dressed rationally, she is treated rationally. She certainly deserves to be. After discovering the essay and dozens of pieces in reaction to it, as well as coming to understand the evolution of Wilde’s thinking on the subject of dress through the development of his lectures in America and England, Cooper had certain choices. He could have shared the research with other scholars, wrote papers to be presented at the various Wildean conferences and societies, or sought an academic press or a commercial house to publish his work. Instead, with the help of his wife, Dorothy Neuman Cooper, and the encouragement of Michael Seeney, of the Oscar Wilde Society of London, and Wilde’s grandson Merlin Holland, he created a first edition book; an abidingly personal, and of course imperfect, approach to conducting literary scholarship that amidst so much identity based theory on Wilde as gay or Irish or anti-Semitic reflects Cooper’s broadly catholic approach. It’s also a rather crisp read. All truths are perfectly obvious once one sees them. The only thing is to see them. 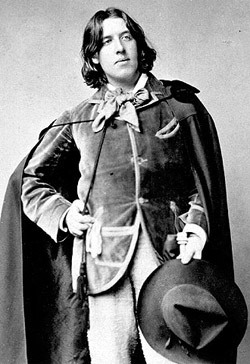 Cooper deftly traces the influences on Wilde through a heterogeneous set of writers and thinkers who came to believe that Victorian dress, with its insistence on imposing an artificial wineglass shape on the female form through use of the corset, was unhealthy and objectified and sexualized women just as modernity seemed to offer new freedoms. Among them were Wilde’s close friend and “first artistic mentor” Edward William Godwin, Viscountess Harberton, the founder of the Rational Dress Society, Dr. Gustav Jaeger, a proponent of practical wool clothing, the author Mary Eliza Haweis, who like Harberton, saw herself as an activist for women’s rights, and Lady Knightly, who exposed health problems associated with corsets. Fashion is ephemeral. Art is eternal. Indeed what is a fashion really? A fashion is merely a form of ugliness so absolutely unbearable that we have to alter it every six months! For Wilde himself, the positive response to The Philosophy of Dress began to allow his true literary nature to flourish, argues Cooper. 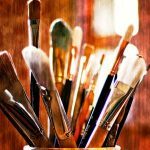 “Not only had he arrived at the middle phase of his predicted path by becoming a writer, but he also moved into the spotlight as a prominent figure in the literary world,” he explains. Perhaps this is the weakest link in Cooper’s argument. Some Wilde biographers, like Barbara Belford, tend to argue the opposite: Wilde repudiated journalism as “the adversary of the artist.” Moreover, one’s career rarely turns on the success of a single newspaper essay. Nevertheless, Cooper treats this part of the story with the same care as the rest, uncovering and publishing here for the first time long discourses in American and British periodicals as responses to Wilde’s ideas. Only now, says Cooper, editors began to commission him to write reviews and articles. His own editorship of The Woman’s World naturally grew out of the recognition he received for The Philosophy of Dress, and not just because he needed the income, as has often been posited by Wilde biographers.